The first step to being a successful franchisee is finding the right franchise. For some franchisees, the choice is easy: maybe they already worked at the franchise or were close with someone else who did. For others, it takes more effort. Ross Harried falls into the second category. Finding the right franchise took an entrepreneurial coach, business books and plenty of conversations with other franchisees and franchisors. Here's how he knew Maui Wowi was the right franchise for him. I was confident that I had the skills to run a business, but I didn’t have a unique product or a service in mind that I wanted to bring to market. So, a franchise seemed like an easy and obvious method to business ownership. It allowed me to step into a system that is already in place, a product that is established, and a brand that is recognized; it was a no brainer. It just became a matter of searching and finding the one that I was most comfortable with and that I connected with the most. My previous job was as the Director of Operations for a small company. I had been with that company for seven years, and was responsible for all day to day activities. During that time we experienced about a 400 percent growth, and I wanted to have some ownership in the company, but unfortunately, the current owner wasn’t interested in that. So, I wanted to do something for myself. I knew that with my background, I could take those skills and apply it to whatever else I wanted to. The concept: Bring the product to the people at events and venues. The brand: The laid back atmosphere, brand loyalty, and the focus on fundraising. The work hard and have fun mentality really appealed to me. The product: My family is very health conscious. We’re very aware of what we allow, and what we don’t allow, our four children to eat. The focus on the nutritional aspect of the brand was strong and I could feel good about offering that product to my customers as well. The success: The moment that really sold me came during validation when I was talking to other franchisees about how many events they continue to do year after year. They were reporting that they retained 80 percent or more of their events year after year; I loved that! My bliss is not found in cold calling and contacting, I do it because it’s absolutely necessary to keep the pipeline filled. But, I loved the idea that I can do the work of finding an event or venue one time and know that when the next January rolls around, 80 percent or more of my calendar is basically booked through maintaining relationships with those events and venues. This retention would allow me to shift more focus onto running my business versus the vast amount of time and energy in developing those new leads. Plus, it would allow for me to build on an already established base of events by selectively adding larger events, or replacing low yield ones. What helped me was working with an entrepreneurial coach. I read books on franchising and how to choose the right one, small business ownership, and did personality assessments so I could really figure out who I was and what was going to work well for me. Then, we tried to match that up with a franchise. He and I worked together to make sure the franchises that I would pick from were the best fit for me. We wanted to make sure that I could see myself embracing the product, the system, and the services. That was really critical for me. Multiple people told me, “This is something you’re going to dedicate the next 10-plus years of your life to, devoting 80-90 hours a week to developing and building the business. It better be something that you can be passionate about." Your business has to line up with your personality traits and where your heart is in terms of products and services. I give a lot of credit to the entrepreneurial coach who brought me to Maui Wowi. Through all our work, he presented me with six different franchise opportunities and I picked three to really dig into. In the end Maui Wowi stood out. He did a great job preparing me and matching my personality with the right opportunities, and Maui Wowi just clicked. To me, that was the ultimate big piece of the puzzle. It matched me. 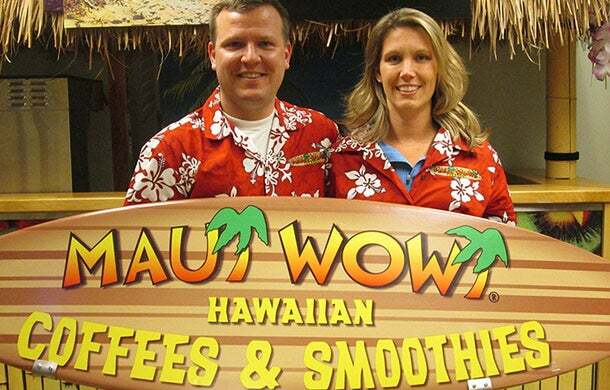 I had done enough research, talked to enough of the other franchisees, read enough books, asked enough questions, vetted a business plan with current owners and had all the right conversations that made me feel 100 percent comfortable that Maui Wowi fit my desires. Developing leads and actually connecting with the right people is always a challenge. I spent almost 40 hours every week just doing that for almost an entire year just trying to fill my calendar with multiple events every weekend. Not to mention I still had to set-up and run the events on the weekends, and do all of the other things that were involved with running a business behind the scenes. So, the amount of time I spent every week on my new business was significant. Developing a book of events definitely took a lot more time and effort than I had expected it to. But this is also where having an established brand within the markets I was targeting was crucial. Going from zero to 300 event days in the first year was only possible because of our brand already being established. Don’t ever treat it as a hobby. Don’t even treat the research of which franchise to go with as a hobby. Start it off on the right foot. Always give the endeavor the amount of time and energy it will need to succeed. Do your research, ask a lot of questions, make sure that you’re completely sold that YOU have the capability of succeeding within the system you’re considering. Once you’ve done enough to make your decision, jump in with both feet. Develop a solid business plan, include benchmarks to gauge your progress and then most importantly, EXECUTE the plan. The business will most likely grow differently than you planned it to, so don’t sweat it. Be persistent, it’s the little things you do every day that add up. Take good care of yourself and protect yourself, physically and mentally. Smart growth into more venues and more premium events. Also, to spend more time training my employees on how to be more self-reliant and to provide them the tools necessary to be able to handle more of the day-to-day items in order to free me up to spend more time working on the business, versus in it.